Have you ever had someone say that they love you so much they “could just eat you up?” Maybe not, its kind of a corny thing to say, but some people do and nost importantly it’s a good lead in for this article. While you can’t literally (and legally) let someone eat you up, if you are in Tokyo this month, you can arrange for someone to eat your face, a chocolate version of it, that is. The FabCafe in Tokyo’s Shibuya ward is running a two day workshop in time for Valentine’s Day that will let people create little chocolate heads that they can give to their sweethearts. For a cost of 6,000 yen (about $65 US) the workshop guests will have their heads scanned and turned into miniature models in chocolate. They are using a ProJet 3D Printer from 3D Systems. The printer is not actually printing the chocolate (although there are such things as chocolate printers). They are being used to print silicon molds into which the chocolate will be poured and formed. The plan is to place the head into a box of chocolates, alongside the other standard pieces, and to surprise your valentine as he looks through it. I said when “he” looks through the box on purpose. While I didn’t even know that they celebrated Valentine’s Day in Japan, it turns out that they not only do, but have some specific customs about it that we don’t have in the U.S. Their tradition says that women give chocolate gifts to the men on Valentine’s Day. In particular, handmade items are most appreciated. In return, men reciprocate one month later on “White Day” with gifts that custom says should cost 2-3 times the chocolate gift. Popular White Day gifts are cookies, jewelry, white chocolate, white lingerie and marshmallows. FabCafe is planning a workshop for White Day as well. I looked into the FabCafe and it’s quite an interesting concept, where coffee meets fabrication. You can simply enjoy a coffee, or you can do some fabricating along with it. It certainly does not look like any FabLab I’ve seen — in fact, in the photos you can barely tell that there is a machine there other than espresso makers. But there is a tidy, good looking laser cutter there, awaiting a customer with an Adobe Illustrator file and a few yen (2000 yen to share the machine with up to 3 people for 30 minutes; 5,000 yen if you want to yourself). 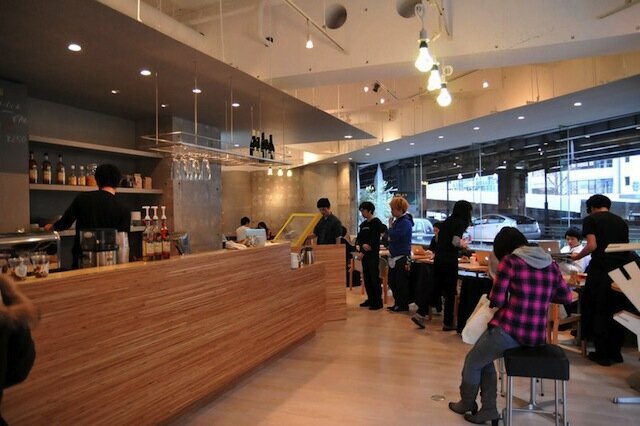 The modern interior of FabCafe in Shibuya, Tokyo. 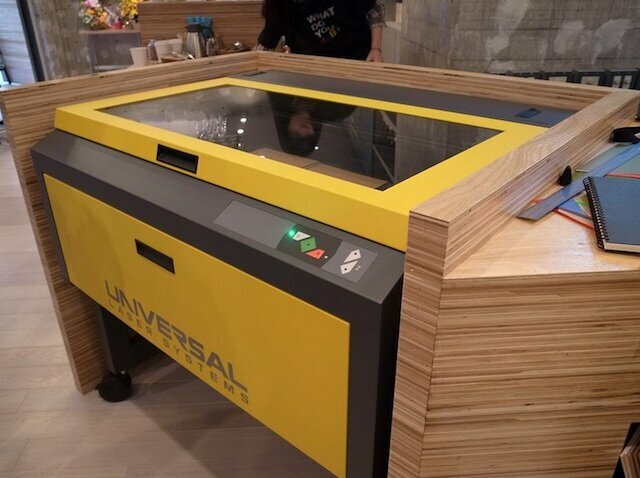 FabCafe’s laser cutter, for use while having an espresso. FabCafe is the brainchild of Loftwork, a digital media production company that collaborates with a network of designers.